Beautiful mountains, flowing rivers and shining beaches… governments still can promote tourism by sponsoring events, such as meetings, conventions and festivals. Hosting or bringing in events is a widely used tourism policy in South Korean local governments since the 1990s. The Ministry of Culture and Tourism (MCT) initiated a plan to develop tourism products by sponsoring representative local events since 1995. Since then, about two to 30 events are sponsored every year. Based on the achievements in the early stage, state-sponsored festivals have been considered a driving force of economic development, activating the regional economy and improving the regional image. Local government leaders have invested in creating their own local festivals and cultural events. As a result, the number of local festivals reached its peak at 926 in 2008. It means that each local government sponsored about four to five local festivals on average in 2008. Some successful local festivals achieved a lot of economic benefits. 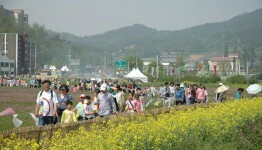 The Hampyeong Butterfly Festival is a representative example of success. Hampyeong-gun is a typical small rural town whose population is below 40,000. Its major industry is agriculture (more than 60 percent in 1990s). However, the agricultural industry has declined for a long time due to the outflow of younger generation and the import opening of agricultural products. To make things worse, there was no industrial resources and tourism resources. Seok-hyeong Lee, the elected chief of Hampyeong-gun, initiated the Butterfly Festival in 1999 to reinvigorate the local economy. Its goal was not only to create an event to attract tourists but also to promote local agricultural products by selling itself as an clean town where butter flies could live. It was difficult to mobilize local residents and request cooperation of local business owners. However, Lee kept trying to collaborate. Long story short, the Butterfly Festival has achieved great success. Hampyeong-gun attracted 1,620,000 tourists in 2000 while only 180,000 tourists visited in 1998. Recently, the Hampyeong-gun government reported that the 2013 festival created 1910 jobs, earned $720,000 alone in ticket sales and its overall economic effectiveness reached $302 million. On the other hand, numerous festivals were created without planning and failed to generate any regional impact. Many local governments tried to hold festivals by imitating their peers, but it caused a reproduction of colorless festival programs. The evaluation report published by Korea Culture and Tourism Institute criticized many local governments for wasting their budgets by holding one-time events that consisted of common and boring programs. It argued that the lack of historical, regional and cultural uniqueness in local events are the most significant reason of failure. Hanam International Environmental Expo 99, sponsored by Hanam city government, was a representative failure case that recorded a deficit greater than $100,000. Hosting an international event was a pledge of the mayor of Hanam city, a plan he pushed soon after his election. It was as an international event accredited by the United Nations Development Programme and its participants were world-leading companies in eco-business. However, there was no company in Hanam related to environmental technology and business. In addition, the event was managed poorly. Hanam city government failed to manage the event. There was no one with the experienced to hold such a large-scale event and it failed to secure enough budget. The mayor pushed the plan in spite of those problems. The enforcement of the impractical plan caused multiple investigations, audits and inspections by council and various agencies. Needless to say, the failure caused significant financial burden to the city’s budget. Lesson 1: Study the historical, regional and cultural uniqueness of the locality first. There are many events everywhere. In the case of new event, it should be unique and based on the locality. There are many sources to find out new items, such as local history, culture, products industry and so on. Having a good focus, such as butterflies for Hampyeong, is half the battle. Lesson 2: Judge your capacity to host events. It is difficult for a small town to hold an international convention. It is necessary to judge the capacity, not just for the budget or the organization, but also the human resources. It is necessary to secure those who have experiences or abilities to manage events as well as to have enough budget and labors to host events. Hanam’s failure would be expected when the city government decided to host an event above its capability. Lesson 3: Host and manage events by collaboration. The bigger the event becomes, the more collaboration it needs. It is not only to receive community support for successful management, but also to preserve the current life of local residents. The increase of tourist could influence the town and the life of local residents in negative ways, such as heavy traffic, crime and price increases. It is thus necessary to combine public opinion prior to hosting big events and return the profit to all. It should be the event of the residents, by the residents and for the residents. You can check out various kinds of local festivals in South Korea here. Author: Byuingwoo (Shine) Cho is a doctoral student in the School of Public Administration at the University of Nebraska at Omaha. Cho can be reached at [email protected].